Dr. Eric Cole & Soulaima Gourani: Security & UN Adviser! Soulaima is founder of Tradeconductor.com world peace through trade, CEO of GETcapitalaid.com, and in 2016 was appointed to be among the ‘Inspiring Fifty’ European list of inspiring role models as well as appointed to be UN Woman Ambassador Advisor…more. Eric is an industry-recognized security expert with over 20 years of hands- on experience in consulting, training, and public speaking. He’s the author of several books, including his newest, Online Danger: How to Protect Yourself and Your Loved Ones From the Evil Side of the Internet. As founder & CEO of Secure Anchor Consulting, Dr. Cole focuses on helping customers prevent security breaches, detect network intrusions & respond to advanced threats. In addition, he is a 2014 inductee to the InfoSecurity Hall of Fame & provides security services for Bill Gates & family. Soulaima is founder of Tradeconductor.com world peace through trade, CEO of GETcapitalaid.com, and in 2016 was appointed to be among the ‘Inspiring Fifty’ European list of inspiring role models as well as appointed to be UN Woman Ambassador Advisor. Soulaima worked as an advisor and speaker for clients such as, Samsung, DuPont, LEGO, McKinsey, DELL, Microsoft, Stanford University, BMW, Cisco, and many more. In March 2012 Soulaima was selected as one of the 192 management leaders in 2012-2017 by the World Economic Forum. Intro: Are you ready for an open discussion with the best of the best and the best of what’s next? Welcome to the Tony DUrso show. Join in on a great conversation today with some of the world’s great influencers, as they showcase great advice and techniques that made them the game changers they are today, now here’s Tony DUrso. Tony: Welcome I’m your host Tony DUrso, we interview world-class influencers, celebrities and elite entrepreneurs and I thank you for joining us. We broadcast every Friday at 1:00 p.m. on Voice America’s Influencers Channel, and you can listen to all our shows on your Android or Apple device, go to TonyDUrso.com/mobile and get the app TonyDUrso.com/mobile. And today’s shows with Dr. Eric Cole and Soulaima Gourani, all right here’s some info on Dr. Cole. Eric is an industry-recognized security expert with over 20 years of hands-on experience in consulting training and public speaking; he’s the author of several books including his newest Online Danger: How to protect yourself and your loved ones from the evil side of the internet. All right welcome to the show Eric. Eric: Pleasure to be here, thank you for having me. Tony: My pleasure and the honor is mine, I love what you do, I’ve seen some of your videos, I’ve watched a lot of your news commentaries and so forth and I cannot stress this enough to the world, we need you Eric. Eric: Yes I’m on a mission, sometimes it’s a hard mission but I’m on a mission to make cyberspace a safe place to live, work and raise a family and I know together we can make that a reality. Tony: I don’t know about everybody, I don’t know what percentage of people have been hacked, you’re probably going to tell us that but I was hacked years back it was one of the worst times of my life, absolutely hated it so it can happen and it does happen no matter how well you think you’re protected, so I am serious we really need to get this message out to the world. But before we go into tips and tell the audience how to be cyber safe, Eric I want to go all the way back take it from the top, I’d love to know how did it all start for you what’s your backstory? Eric: It’s a fun story my friend and I will tell you, one of the things I push to my kids and when I talk to high school students is it’s amazing how coincidences, little things in your life can basically shape your future. So I loved and was fascinated with how things were built, I’m still amazed when I look at a bridge and say how in the world does that stay together and you look at a building in New York City and say how does that stand, so I wanted to major in architect since I was very little. And when I was about 17, a friend of the family now remember this is in the mid-80s, said here everything is going to computers, the future will be based on computers so instead of majoring in architecture why don’t you major in computer science and then you can do anything you want. If you know computers, if you know how to program you can program applications for buildings or anything you want, so I said okay that sounds like pretty good advice, I like math, I like science. So I enrolled in computer science at New York Tech, and after about a year because remember this was still early stage computer science programs, a lot of engineering Fortran, like some people might remember good old Fortran programming language, a lot of physics and after about a year I said you know something I don’t know what a computer scientist really does and whether I want to do that for a living, so I went down to the co-op office at my school and said hey can you get me an intern, can you get me some real-world experience so I can see what this is like and the lady looked at me instead Eric of course but we need you to do us a favor, in three days the CIA is recruiting on campus and we don’t have enough applicants we promised them 20 students and we’re a little short, we don’t have time to prep you so you’re not really going to do well or anything like that, but just can you show up and be a buddy and help us out, and then we’ll meet next week and prep and figure everything out for you. Like of course always about helping people out, so I show up for the interview sometimes the best ways to be done the naive because you don’t really know what you are getting into, so I just show up and I go into the interview and do my thing and at the end the gentlemen from the CIA hands me this big envelope and says we’d like you to fill out an application. I just assumed that was normal, so I walk out with this envelope and all their faces are like how did you do that, like how did I do what they were like you actually got to the next level I mean you did good we weren’t expecting that because we didn’t prep you. So it was cool because this was before all of these genealogy programs on the internet and everything else, and you have to go back for generation, so me and my parents spent many evenings a great bonding experience I still remember with my mom and dad, tracing back our history and a great-great great-great-great grandparents and getting the application filled out and ready to go and after a month or two I sent it in, and basically when you send it in you get a little letter that says forget this ever happened you’re probably never going to hear from us again, just go on with your life we’ll call you don’t call us. So I go back to the co-op office and they set me up with an intern at Grumman aerospace where I did type of security work for the radar system for the f-14 fighter jet, and got to play with real world simulators and sat in the cockpit of the airplane super cool stuff and I basically forgot about the CIA. And then a year later I get a call that says hey we want to fly you down to DC for a couple of days to go through the interview process, so once again fly down, go through all the checks, the poly’s all that great stuff and they finish it with once again yes 1% make it, so you’ll probably never hear from us again don’t call us we’ll call you. And so I go back to school and continue in a few months later they call me saying hey we’d like to offer you a full intern, you have passed everything, now the interesting thing is that the CIA interns are free resources, so once you get your clearances and once you’re all set and approved all the offices fight for you, so now it’s a reverse interview now they fly me down but all of the offices are trying to convince me that I should go work for them. And I did an interview with a network operation center, with the operating system division all these different and I still remember my college professor going Eric networking is the future, you should go with the networking group. And I said but there was this group that did security, they go so Eric cybersecurity is the fad, you’ll never be able to make a career, you’ll never be able to make a living, in a few years everything is going to be secure so you shouldn’t do that. Now you can clearly see that I don’t follow direction very well, I am the type that if you tell me not to do it I’m going to do it. I love the security stuff but that was probably all I needed to make it happen, so I went to the office of security and I guess you can say the rest is history and that basically set me up on a 30-year journey in which I loved it and I don’t regret it one bit. And what I love about cybersecurity is every day is a new challenge, every day you’re trying to fix really hard and difficult problems and you’re in a constant chess match you have a real adversary, nothing against accounting but accounting you learn how to balance the books, you learn how to do the math it’s pretty standard, still some challenges but pretty standard job, cyber security is always different, it’s always changing and I’ll tell you if you walk away from three months and you don’t stay up on the knowledge, the reading, the material you lose that knowledge very quickly. So it’s been a fun journey from there, I then did internal security during the dot.com era, I then I helped build some companies so in addition a cyber security I’m an entrepreneur, so I helped build the company sold that to Lockheed Martin stayed on there for six years being the chief scientist for Bob Stephens the president of Lockheed Martin, and I’ll tell you that was a job nobody wanted and I loved it. Basically whenever anything went wrong, when the Chinese broke into the Joint Strike Fighter, when systems got hacked, when systems went down I got called and I basically had to be on a plane and respond in a moment’s notice and I loved it. There were always new issues, always new challenges, you were always in the thick of it and to me it was just a great adrenaline rush I just totally loved it. Then I went to McAfee, help them build out their company once again sold that to Intel and then I’ve been running my own type of security companies to carry anchor ever since, I love teaching, I love helping people, I love making cyberspace safe, everybody makes a difference and I just love helping people and the fact that I get to do the two things I love Teach and cybersecurity I tell you man I don’t work, I wake up every day I have fun and I am a blessed man. Tony: Wow Eric, I am so impressed at how it all started and I can tell right away that because you were in a way a nonconformist and you think outside of the box I think that’s a part of your claim to fame, at least that’s how it appears to me so far. But it’s such an exciting world you’re in, as you’re reading this I’m thinking it’s like an action movie with all the things that happen, because you really in this industry because it changes with technology and it morphs and we don’t know what the Internet’s going to be like next year, there are changes and you have to adapt to it. So I can totally see that this is like really exciting. Eric: I joke with people but my life is basically a fiction novel, because the stuff you read about in the novels about the hacking and people breaking in and stealing information that a lot of folks don’t realize is really happening, I basically live on a daily basis so yes I’m basically a really good Tom Clancy film. Tony: I love it, by now our audience is sitting on the edge of their chair saying give me some stuff, so how about we jump into a couple things your newest book Online Danger: How to protect yourself and your loved ones from the evil side of the internet. Let’s just take a couple of things at random, let’s start with here please some tips to stay cyber safe this year. Eric: Awesome, so the first thing we have to cover and I’ll warn some of the listeners they might not like what I’m going to say, because some people like to live in a bubble where they think the world is safe, everyone is safe and everyone is good. I will tell you right now if you have a computer, if you have a cell phone, if you have a wireless access point and you’ve had those for more than three months you have been hacked. You might not have realized it, you might not have detected it, you might not have even known it happens but unfortunately the world we live in you are a target, and we are all being compromised. And I know most people don’t know oh Eric, I’m just an ordinary person, I just get up in the morning and I go to work and I do my job and I come home, I’m not famous, I’m not high-profile, nobody knows about me, I don’t have a lot of money in the bag no one, Eric seriously nobody could want to target. And if that’s how you think the Russians thank you, the Chinese thank you and the North Koreans thank you, because they are all targeting you that’s who they want, they want the person that does not think they are target, that let’s their defenses down and doesn’t protect themselves. And you might say but why would they come after me? It’s simple, if I’m the Russian and I want to steal five million credit cards or five million bank account or five million identity, I could target a large government agency and it does happen and I can spend nine months trying to break in to steal those five million records or I could target five million individuals, who have no security staff, no security background that don’t think they’re a target and who do you think’s going to be easier to break into, and they’re going to target and break in to those five million people, steal all their information and then here’s the part that most people don’t realize, they usually sit on it and sell it multiple times before it’s ever actually used. They’ll usually after your information is stolen it doesn’t actually get used for three to four years later, so right now your passwords could be stolen, your bank account could be stolen, your credit cards could be stolen and you have no idea because the attacks haven’t occurred yet. So first and most important to be safe in cyberspace recognize that you are a target, you are a number to the adversary and you’re just one of five million people they’re going to go after and as soon as you recognize that you can be a target you’ll change your mindset. Tony: Eric let me ask you something on this because some people would think, okay my credit card I’m only liable for like fifty dollars or something if it gets used I can get my money back it doesn’t matter. If my bank account gets tapped by someone I claim fraud I get my money back, there’s regulations in place that protects us as well from fraud, so what is the real risk here just so you can help us understand better how serious this is? Eric: Yes you’re right, credit cards are fairly safe relatively speaking but you still have to prove it, you still have to do all the work and you still have to do all the analysis. So I’ll give you some real numbers, if we’re talking light identity stuff and what I mean by light identity theft is they get one or two credit cards, they get your bank account and they might get some or all of your social security number, do you realize just recovering and cleaning up from that typically is 300 hours and $8,000. So yes technically in the long run after you spend 300 hours and after you spend $8,000 you’re going to be back to a good normal state, but you still have to put in the work, you still have to prove it and you still have to do all of that. So yes there are laws out there but they don’t necessarily save you the time and energy. Tony: This is the Tony DUrso show, just ahead the chat continues with Dr. Eric Cole and Soulaima Gourani, but first it’s time for us to take a short break see you back here in just a moment. AD: This is the voice America Influencers Channel, be inspired. AD: Years ago I wanted to capitalize on the holidays, so I took some angel pictures and put them on t-shirts, they came out nice. Then I went to swap meets and street events, the t-shirts always sold out right away and it was a lot of work to get more made and there was a wait time of a few days and it was a big hassle, then it would take the next batch out and they would sell out right away. I wish I had Printful back then, they make it so easy to have a home business, imagine your artwork or your logo on backpacks, t-shirts, embroidered shirts, tank tops, leggings, hoodies get set up with Printful.com at no charge, that’s right it’s free to start your own online business with Printful they make it easy to launch an online clothing brand by printing and shipping products for you on demand. Connect Printful to an e-commerce platform, upload your designs on more than a hundred and fifty products and start selling no subscription fees, no money to buy bulk inventory, just start selling and sign up now at Printful.com P-R-I-N-T-F-U-L.com you’ll love it. AD: We don’t follow we lead, join us The Voice America Influencers Channel. Intro: You’re listening to the Tony DUrso show with key influencers, we’d love to hear from you via email be sure to send questions and comments to Tony@TonyDUrso.com, now back to Tony and his guests. Tony: All right we’re back on the Tony DUrso show; today’s show is with Dr. Eric Cole and Soulaima Gourani. As founder and CEO of Secure Anchor Consulting Dr. Cole focuses on helping customers prevent security breaches, detect network intrusions and respond to advanced threats. In addition he’s a 2014 inductee to the info security Hall of Fame and provides security services for Bill Gates and family. All right, and now back to the chat with Eric. Eric: And just from what you said yes credit cards very safe, what most people don’t realize is a lot of the liability laws don’t count for debit cards especially if you gave up your account information. So if you were fished and you openly gave them a transfer, so you were tricked or manipulated and you transferred five thousand dollars out of your bank account and you actually did it, you’re actually liable. The only time the bank is liable for fraud is if they stole the money from you, but if you authorize the money transfer technically that was an authorized transfer, you were tricked and manipulated but that’s not the bank’s fault that’s your fault. So a lot of people don’t realize that a lot of the ways the adversaries work you are not necessarily always protected and covered, and you could absolutely be out of money. Tony: Got it, that is a little scary especially with the amount of time now I get it, so it’s quite a nightmare even though we’re protected all that work who can handle that kind of time and involvement just to get their life back in order. Why is that advantageous to the attacking company, they know you can put your life back together, they know you don’t have much money or they can tell when they look in your account, why is it done, is it done because of hate, they want to get back at us, they want to destroy this culture what’s some of the underlying reason for this please? Eric: Well the number one reason is money and most of these attacks that come from Russia are all financially driven. And once again you might say Eric why would they steal ten dollars from me, ten dollars isn’t a lot do the math, if I steal ten dollars from five million people that’s them serious coin, that’s some serious money and that’s what it’s all about to them. They know that if they go in to steal five million dollars from a bank it’s not only very hard but the laws that you’re breaking are huge, but if you steal ten dollars that’s a pretty low-level crime at that point so what they want to do is steal a small amount from a large number of people, and then here’s the kicker most people don’t even notice. Most people they look at their credit card statement at the end of the month and they might scan through it, but they’re looking for big over issues, they’re looking for somebody who spent two or three thousand dollars or something big that they’re going to catch. Most people would not catch a two or three dollar deviation, if you went to dinner and you know that your dinner was about $60 and somebody added three dollars to that charge, do you actually keep the receipt and verify and validate the exact amount most people don’t, so most of these crimes are so low end that they don’t even catch it. Now here’s the cool part, the good news I know a lot of people like them I’m just going to give up my life and become Amish at this point, but the good news is that there is built-in security do you realize every credit card company out there and this is what I do has auto-alerting, so every time you make a charge with your credit card you get a text, so now I’m in a restaurant I just took my daughters out to Olive Garden the other day I loved all-you-can-eat breadsticks and salad you can’t beat that, and as soon as I pay with my credit cards like 73 bucks literally I get a text on my phone seventy-three bucks, I verify the amount, I say approve and boom now I’m doing real-time verification. So not only does it reduce the exposure but I don’t have to do any work at the end of the month, so there’s a lot of these tools that are built-in that people don’t even realize and they’re not taking advantage of. Tony: Oh I like that okay. So to our audience here check that out and get those automated texts and I like that, so if you know your bill is 70 dollars and you get that automated text, let’s say 70 dollars with tip and you get an automated text saying we’re going to take 78 dollars or 80 dollars then you know that something’s up. Eric: Exactly bingo, you know real time right away and you don’t have to worry about keeping receipts or checking with your records later. Tony: I like it, now there’s so many stories I hear of people being hacked and there’s so many things to do and as you jokingly said should we just be Amish, we live, we are somehow corralled into using the computer, it’s convenient we like the phone they’re convenient and I’m sure there’s no such thing as a hundred percent, but Eric can we really be even 99 percent secure? Eric: So what I always jokingly say good because it’s funny it hit me last year, I was giving a talk and I said and this this happened live in front of an audience. I said a hundred percent security does not exist, and then I actually caught myself and I started thinking out loud in front of the audience which is always dangerous, because my brains a scary place and I said to the audience like I said wait a second is that really true, is it really true that 100 percent security doesn’t exist. And I held up my cell phone and said can I make this a hundred percent secure, and most of the audience said no and there was a guy in the front said smash it to pieces and bury it in a ditch, and I looked at the audience and said hey will that make it a hundred percent secure and everyone said yes I said okay. So a hundred percent security does exist but there is zero functionality, there is zero usefulness and this is when it clicked on me, every time you add functionality whether it’s in your life, whether it’s with computers, whether it’s in cyberspace you are sacrificing that functionality for security, so you’re reducing that security a little bit. And a great example is when you decide to drive a car and I decide to go 80 miles an hour, I know that going 80 miles an hour I’m increasing the functionality of getting to my destination quicker, but I also know that if I get into an accident there’s a higher probability of dying so I’m making a sacrifice of security to get that benefit of functionality. In the real world we tend to subconsciously think that way, in cyberspace we don’t. So we always need to ask yourself if we’re going to install a new app on our phone, if we’re going to put an Alexa in our house ask ourselves is the functionality work the exposure, is the functionality worth the risk of having a device in our house that listens and records everything we’re doing, now if your answer is yes then that’s awesome and that’s all I ask for. We emphasize as a security professional I’m never going to tell you not to do something, but when I get so upset is when people make these naive decisions where oh yes we’re going to put Alexa in our house but they don’t recognize the exposure and danger it poses to their family. Tony: That is a very good explanation, so we can be very secure but every time you use your emails, your web browser, your phone, use an app, download an app, you’re opening somehow up to exposure and you just have to, I’ve seen some of your great videos and your news commentaries to shut off the app when you use it like your Apple pay, you might use it you’re going to open yourself up to risk, but as soon as you’re done with your purchase shut it off so that in itself that little discipline, that self-discipline can help us be more secure as well. Eric: Exactly, and as simple as that I always like using is do you work 24 hours, are you up 24 hours a day? No, you sleep. Now depending on your habits you might sleep for 4 hours, 8 hours or 10 hours, I know we were joking before the show I get up at 4:30 in the morning, so I tend to go to bed a little earlier there to do my exercise, but the point is we sleep, we turn off. Brings the question why don’t you turn off your phone when you go to sleep, why don’t you put your phone to sleep, why don’t you put in on airplane mode, when you’re turning off the lights in your house why don’t you turn off wireless. We tend to think that our technology needs to be on 24/7 even though we’re not using it, and that’s usually when the attacker strike. My favorite example is I travel a lot in hotel and this hit me a couple of years ago, I’m in a hotel and literally 300 feet in any direction there’s probably seven or eight different rooms that could access it and I’m like I’m going to sleep for seven hours yet I’m leaving my phone turned on with wireless, with Bluetooth, with all these apps, with all the stuff happening and I said this is crazy. Why don’t I reduce my exposure by just putting it on airplane mode, putting it to sleep when I go to sleep and now you’ve just taken away the target vector from the adversary. Tony: I like that, that’s so true. Tony: This is the Tony DUrso show, just ahead the chat continues with Dr. Eric Cole and Soulaima Gourani, but first it’s time for us to take a short break, see you back here in just a moment. AD: Change starts here; change starts now, join us The Voice America Influencers Channel. AD: You hear that a majority of businesses fail, don’t be a statistic get my book free The Vision Map: Beat the odds for your Business Success get it free at TonyDUrso.com/vision and set up your own successful vision map TonyDUrso.com/vision. AD: Hear the stories, be motivated, be inspired join us today Voice America Influencers. Intro: You’re listening to the Tony DUrso show with key influencers, we’d love to hear from you via email, be sure to send questions and comments to Tony@TonyDUrso.com, now back to Tony and his guests. Tony: All right we’re back on the Tony DUrso show, today’s show is with Dr. Eric Cole and Soulaima Gourani, and now back to the chat with our guests. Tony: Eric what are some of the most dangerous applications that we can have in this high-tech world we live in today? Eric: The most dangerous applications are the ones that you’re not using, are the ones that you install and you don’t even realize it, because with a lot of people especially when we talk about our phones and I hate the term smartphones, I tell you when my kids pick up a phone they don’t become smarter they become dumber, it’s a dumb phone not a smart but we’ll call them these smart phones. The point that people don’t realize is when you install an app, when it’s first installed if it’s going to use your camera, use your microphone, access your pictures it has to ask you, but we are so anxious to get this app that when we install the app and it ask questions we don’t even read it yes, I mean we agree to anything. I mean I watch people when they put in a new app they’re just hit yes like crazy not even paying attention and here’s what they don’t realize, when you say yes that one time that basically means for the remainder that app is on your phone it can access your camera, your microphone, your location, your pictures without ever asking you again and you have no idea that’s happening, and we’ve seen this being used not only to target individuals with kidnapping and child predators with children, but we’ve used this to be able to steal information, access data, blackmailing if people have inappropriate pictures and things like that. So what you want to do is if you’re not using your app you want to go in and delete it off the phone, and you want to go into your device for example I use an Apple device so I would go into the settings and under settings I would go under privacy and then under privacy there’s a location services, a camera, a microphone you should click on each one of those and it will tell you all the apps that are accessing your location, all the apps that are accessing your camera, all the apps that are accessing your microphone. And I would tell you never ever once when I have somebody do this do they ever go oh yes that’s normal they’re always shocked, they’re always like why is that app there. So their trick is remember what I said if you need the functionality that’s great, but get rid of the things that you’re sacrificing security for that you’re not using, turn off the apps get rid of the apps that don’t need to access your camera, your location and your pictures. Tony: Your new book the information and we’ve discussed, I’m sure a lot is in the new book as well as more and you can find out about that and you can find out more about Dr. Cole at onlinedanger.com check it out. Well alright, very exciting great we talked about a lot of stuff, you are the cyber ninja you’ve done so much working at amazing companies, I would love to have you back and I just want to thank you so much. Eric: It is my pleasure, and Tony I will tell you if you want to have me back on your show it would be an honor and a privilege, you just let me know when and where and I’ll be there. Soulaima: Thank you so much for inviting me. Tony: My greatest pleasure, you’ve done so much it’s such an honor and I have so many questions about how you’ve done so much in so little time, but the first thing I like to know is how did it all start for you, what’s your backstory? Soulaima: Well I like to start in 2007 because that was a crucial moment in my life, I was fired and I was pregnant and I had to make a living, like really it was my low point. I used to be employed in the biggest most fantastic jobs in some of the most recognized, well liked, big organizations I’ve always been a salesperson and I always thought of myself as a hard-working, successful woman. And then suddenly one day I woke up and I was fired I didn’t have a job, and I was about to become a mom for the first time and I was the breadwinner of my family, that was really a low point. But I cannot afford to give up, I don’t have the pleasure of lying down I have to stand up and I have to stand straight. So I decided I thought about what is my number-one skill, what is my true talent and it is speaking, you and I we have something in common we love talking and we love talking to people and telling stories and motivate other people and that is my number one skill. And then I decided you know what let me try to sell myself as a keynote speaker, as a presenter and then I just activated my network and told them now you can hire me, my price is this and this per hour and I’ll come and motivate your sales people. And Tony frankly that was the beginning of my keynote speaking career and I’m speaking in 35 countries now, and at this point I couldn’t speak in English this was in 2007, I could only speak Danish or German so in a few years ago I had to sit down with a teacher and simply learn to speak English, and now I moved to U.S almost three years ago. So that was actually how my real own life design started, that was by being fired. Tony: I am so impressed, it’s similar in a way to how I went from being a marketing person to a podcaster, not fired but I had a major business shift that required me to reinvent myself. It’s very interesting I’ve interviewed so many people and when this life changing, it’s not a really catastrophe but then it is when it happens it’s amazing how it really lets what skill and talent a person has just come right on up and just shine and it’s just amazing how people like you, you just go with the flow and look at the success you would have never done that had you still had that cushy job. Soulaima: No I would not, but frankly when I look back at the situation there’s actually month that I don’t remember because I was so in shock and I just had to find my way out, it was a very painful period of time but it was a very important part of my life because I learned not to waste a good crisis, when a crisis hit you, just embrace it and just get the best out of it. Like I didn’t have a lot of savings, I don’t have rich family, like I didn’t have anything that could help me I had to make money the month after Tony, I didn’t have a business plan, I didn’t have a home page I had nothing. I mean the only thing I really had was a few references from my former bosses but like most people right, I mean you have a resume and maybe some people are saying nice things about you but I didn’t have anything, no social media hashtag this was 2007 Facebook was just something I started I had nothing. Networking was at that point really something you had to go out and do, put on your nice dress and go out and meet people, there was not that whole online I mean there was right but it was hard work. But thanks to technology today and thanks to social media and that intelligence, I can sit in Palo Alto I live in California and now I can sit here and maintain my global business, I run four companies from California. And when I look back at my life 2007 till now, now I have two kids and I have a rich life meaning I fly and I ride and I talk and I run my businesses and almost everything can be done remotely. So part of the story is also after traveling the world for ten years I realized this is exhausting, sometimes I had in small countries I can easily have three or four talks in one day, I don’t know how many countries that is possible within but you can do that in small countries, and I had a driver driving me from one place to another place and I was sitting at the backseat eating my protein pass and not really knowing what company I was going to visit next. So I was actually killed by my own success if you can say so, I mean I experienced three-four years ago that I was so successful with what I was doing and I hadn’t taken any breaks for all those years, that I was close to a burnout and I decided. That is also a crucial moment when you say where are you now, because I decided to move to U.S and I decided to move to Texas, I’ve never been to Texas before we just jumped on the flight, we just took the kids and my husband and we just flew to Texas and we moved in. And I’ve never been to Texas before, I didn’t know anyone in Texas, I moved to Texas to remove myself from my own success, I don’t know if this makes sense but I could not say no while I was still in Europe, because it’s very hard to turn down 10K offers every day, I mean I cannot do that. I grew up my parents went bankrupt twice, so for me to say no to money or no to work is actually the most difficult thing, I’m willing to sell everything like my own birthday or whatever just for working. So I don’t know how to say no and so by moving to a country and even to a state as Texas, I knew I had removed myself so far away from my market that if I say yes well then I need to go on a 16-hour flight right, and so that would be something that would force me to think about what I’m doing. Almost three years ago now I’m running four big online communities where I serve my members and I teach them all the things that I used to be teaching from the stage, though now I sit in front of my computer in my own home and make maybe even more money than I did from speaking. So Tony I have to say I reinvented myself again just very recent and now I just went to Stanford University to give a talk on communities and I realized that suddenly I’m actually in a situation where I’m teaching people, again how to think more remote, how to build communities, how to impact and scale without burning yourself out. My foot is now in the new business world namely the world of communities and this was something I had to force myself to start doing and the move to Texas was a part of that plan. When you say where did it start well it started when I was fired and now I’m in a new chapter of my life, because I was so successful and I couldn’t say no, so I had to redesign my life. Tony: This is the Tony DUrso show, just ahead the chat continues with Soulaima Gourani, but first it’s time for us to take a short break see you back here in just a moment. AD: You hear that a majority of businesses fail don’t be a statistic get my book free The Vision Map: Beat the odds for your Business Success, get it free at TonyDUrso.com/vision and set up your own successful vision map TonyDUrso.com/vision. AD: This is the Voice America Influencers channels, be inspired. 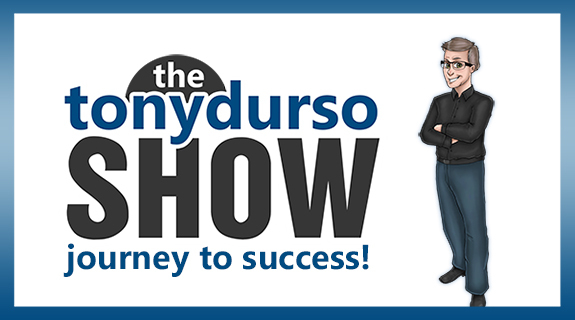 Intro: You’re listening to the Tony DUrso show with key influencers, we’d love to hear from you via email be sure to send questions and comments to Tony@TonyDUrso.com now back to Tony and his guests. Tony: All right we’re back on the Tony DUrso show, this segment of today shows with Soulaima Gourani. Soulaima worked as an advisor and speaker for clients such as Samsung, DuPont, Lego, McKinsey, Dell, Microsoft, Stanford University, BMW, Cisco and many more. In 2012 Soulaima was selected as one of the 192 management leaders in 2012 to 2017 by the World Economic Forum, and now back to the chat with Soulaima. Soulaima: Before we had to sit down to this talk I went for a long walk and it was morning it was like 9:00 a.m., and when I do these walks in the morning I still feel a little bit guilty, I should really be working or I should really be productive. So for me this is also a learning how it is to be working in a new way, under new conditions, in the new economy because I don’t need to work a lot, I just need to be really good when I am working. So I’m reinventing the whole way I’m working and I’m more successful than ever and I work less than ever, so it’s a very new way for me to think. Tony: Soulaima few are the people that have accomplished so much as you in such a short time and I mean very few, I’ve interviewed hundreds of extremely successful people the list of what you’ve accomplished is so long, I can’t even put it in the bio in the show notes, there’s so much you’ve accomplished I’m astounded, and yet you’ve reinvented yourself your gutsy you’re like the Miss Indiana Jones of online remarket myself, I’m so impressed at what you’ve done and you’re so successful at it. To give the audience an idea or an example of some of the items you won the Rising Star Award, The Talent 2004 award you’re listed is one of the top 100 talents in Europe, you’re one of the 192 out of seven plus billion people you’re one of a hundred and ninety-two management leaders in 2012-2017 World Economic Forum, I can tell I’m making you blush I’m going to stop, the list goes on and on it’s like ten miles long. It’s quite stellar what you’ve done and here you are, I don’t know very many people that would just turn down 10k jobs every day and just move somewhere where they could just have some peace and quiet and reinvent themselves, you’re beyond gutsy I don’t have a word for you yet we’re going to have to figure this out. So it’s not just really being at the right place at the right time, you make things happen, you don’t care where you are or what your circumstance is you just make things happen, there’s something way inside of Soulaima here, is it your purpose, is it motivation, what is it that drives you please? Soulaima: So first of all what drives me well I have to say I’m traumatized by being fired and I actually have to say that I have been loyal to my managers all my life, and I pictured myself as this business career woman or whatever what do you have not. So after being fired I made a decision never to be in a situation again where anyone could fire me, and I decided if I find the keys to the perfect way of working, meaning never have to bend my values if it means that I can design my life so that I only work with clients that I care about that, that gives me energy, that is positive then I’m going to motivate people to do that the same. So what drives me I’m a big giver, meaning everything I experience I always think about how can I explain this to others so they can do the same, so you can say I have two of my own books out but I’ve co-written 16 books or something, my next book is out the publisher has to have it after New Year so it will be March or April next year my next book is out. It’s always on life design, how to design your career, how to build yourself a brand for instance my next book is about the future of work how to read the future and how to design your life so that you will never be unemployed again in the future, I’m really driven by giving back. I wish when I was 20-25-30 I wish someone had given me a recipe or a model or a framework that made me understand that the future is going to be alright and these are the things you have to do for you and matter to be okay, but no one gave me that recipe I had to take all the steps myself and it has really been extremely painful. And I had this conversation with my husband yesterday with whom I’ve been together with for 23 years, so he’s really my soul mate and we talked about that I still think that I have a lot of adversity oh then something happens, then something happens and then something happens and he said you know what from the outside it looks like you have no adversity, you make things look so easy and you always survive and you always get the best out of it and it was kind of surprising because I think that I have much more adversity than I actually deserve. So I think I’m just really hard-working and I never complain I just really work and then I think a lot, I spend a lot of time on my own I’m actually a little bit introverted, it might not make sense because my work is so extroverted but I’m a super introvert in terms of if I don’t get three or four hours daily where I can think then my work is heavily impacted. So I’m driven, I’m driven by giving back to people so after this conversation even I’m probably going to be so inspired that I’m going to write a column or an article, I blog and write for I don’t know how many magazines, I know that Forbes just asked me last week if I want to write for them on a regular basis. So I write for so many magazines and that is my biggest pleasure to give people back, really yes that is just your answer. Tony: Well I love it thank you for the short answer, and a couple of comments is congratulations on being with your husband for 23 years it’s an anomaly so I when I run into that I like to acknowledge that. This December I will be with my wife for 26 years, so you’re almost caught up. Soulaima: Yes, no I think love I don’t know about you but when people ask me what makes you proud and then well people will say I don’t know, I actually always say I’m proud that I didn’t mess up my marriage. Because frankly I used to travel, I mean I haven’t been traveling for a month that is the first time in 15 years I’m not traveling a month only and I already feel I’ve been home forever, it’s only been a month where I haven’t been flying but can you imagine having a wife who travels in 30-35 countries in a year, sleeps at all those hotels, all those dinners, gala parties, you go to Royal dinners, you meet with presidents, you do all those things and you see it on social media and I’m an expert in making my life look rather easy and nice on social media, I think most of us do that yet the real story is not the same. But he also see all those things from social media and I think not messing up my marriage and it’s actually our wedding anniversary today. Soulaima: Thank you, and that gave us another opportunity again to celebrate life and love, and I have to say I’m so proud that we are still married and if people ask me what is the number one dream of your life and I say I don’t know for me it’s very clear I just want to become a very old with him, and I want to have grandchildren, because if I am with him and if I become a grand mom I think I’ve succeeded, ,y two biggest fears namely the fear of dying early and being left or leave my husband. So these actually my two main wishes in life and also I cannot be successful at work if I don’t have anyone in my life who loves me just the way I am, because as your job I believe as most people’s jobs it’s very hard to be out there and put your skin in the game and so I need someone who supports me 100% and since we’ve known each other, since I was 20 he was only 18 we have been through so many things that it’s a life chapter, and I have never known a person for this long, I never lived this close with anyone but him for all those years he is my life really. And also Tony I have to say that I used to be the breadwinner, remember I said I was fired I was the breadwinner when we moved to us he got the chance to start developing his next career himself, he used to be a police officer and a teacher and he started coding and now he’s one of the most I don’t know maybe one of them or at least here in Palo Alto, he is recognized as one of the most acknowledged designers of communities, and it’s a coding skill, it’s technology and he gets a lot of offers for personal brands and companies if he wants to work for them and he works for me. And it such a pleasure to see someone who loves this much, who’s been taking care of the kids for so many years suddenly also gets a second or third chance and now he’s actually as if not more successful than I am, and all this happened in just two years. So he learned himself a new skill that he knew that people would need in the very near future, and he taught himself in the nights while he was helping me and the family do throughout the day and supporting me in my new career over here in U.S. and he did it himself. So I’m witnessing again my old partner reinventing himself, so I’m very motivated by letting people know hey you can have five or ten careers if you have the method, if you know what to do you can reinvent yourself over and over again, but it’s really a matter of your mindset and you can actually be killed in success. So make sure you always stay loyal to your values and if you don’t feel excited anymore, if you don’t feel like that you do your best every day then it’s really time to think about your move despite how much money you make, really. Tony: I’m so taken by your story so impressive, so much you’ve done and you’re just living life to the fullest, it’s infectious I love it. And one thing I noticed one of your main quotes, your main buy lines on your website is you say that you spent your life constantly communicating your vision and by the way, I find that extremely effective as well and it’s in a new book that I’ve written and I give out called The Vision Map: I might change the tittle. Tony: Thank you, The Vision Map is quite amazing and it’s what got me to the success I have in podcasting and TV, but that’s a different story. What I’d like to know from you is we’ve already talked about how you’ve reinventing and it doesn’t matter you can take any situation, you can take any environment and become successful at it because you’re focused on your vision, you’re constantly communicating it why do you find that so successful, why do you find that works? Soulaima: You know by the way I cannot wait to read your book it is very much needed, I am astonished when I talk to people like people my age, our age, our generation people who have worked for many years and when I ask them so what is your vision what is it that you want to do with your life they don’t know the answer and I’m horrified by the fact that you can live and work an entire life without knowing why you’re doing what you’re doing, and it’s not a rich people privilege it’s a basic privilege to understand why, because when you understand why you’re doing it then you become much more authentic and it’s much easier for you to get people to help you. For me a vision is something that is much bigger than myself, so it’s about serving, it’s serving a community or serving some people or even your church or whatever, it’s about helping and being something bigger than life and bigger than you. For me communicating my vision the number one thing that happens when you do that it becomes incredible easy for people to help you, because when you explain over and over again why and what you’re doing and what you’re trying to build or trying to do, if you can explain the people who ever listens to your vision, if you explain to them why you’re doing what you’re doing people get dragged they want to help, they want to come along they want to support your mission and you know what no one can create success on their own, you need people to follow, to help, to open doors, to recommend. So the number one rule if you want to be successful whatever success means for you you will need people, and if you need people then they need to understand why and what you’re trying to accomplish, so from the very beginning I was explaining my vision and people they was so inspired and so I think that that’s the main thing, if people understand why you’re doing it then they feel more likely to help you and then you will accomplish what you are doing. But also remember even despite how successful you become in life it might be status, it might be money, it might be whatever really always be nice to people, it’s very easy to forget, if you’re very successful you don’t have the time to answer this email or you’re more likely to let your assistant I have a great PA and she answers a lot of my emails and I still have to remind myself being nice to people because I am nothing without people supporting my vision, I’m nothing. I went to the Kennedy School I was very lucky four years ago to do it 10-14 days executive education module at the Kennedy School in Boston, and I had a teacher, a professor Bill George he actually wrote a book called True North, I believe it’s called True North and an American bestseller. And I read it and he talked about always finding your true north and finding your home and finding your why and we all know this right, but he forced me in two weeks to keep working on why I am doing what I’m doing and he forced me to look back at my life and I have a very traumatized story, I was kicked out of school, I lived in the streets I grew up with foster parents, children’s homes, institutions you know it’s just very troubled. And he forced me to look back and to look at all my traumas and find strength in all those things that have happened and that gave me that energy and clear focus on why I am here. And I’m here to give a voice to all those people out there, that daily gets told you don’t have the right high grades, you don’t have the right education, your race or your color or your gender or whatever people gets told every day. I’m here to give them a voice and give them a platform, giving them a method and kind of saying if I can do this you can do this too because remember I was kicked out of school, my grades at school are not very good, I mean I’m not like a very intelligent person or anything I’m just really hard-working, determined and focused and I have a lot of self-discipline and all that, but that can be taught that is something people can learn. So that’s what I’m motivated about doing and many more people are facing issues every day because they feel wrong, they don’t feel they can work the way their managers want them to work, they don’t like their jobs there’s so much potential out there. I want to free people, basically I want to free people let them understand that fear and anger and all that is something that can be turned into amazing drive, amazing potential. Tony: Soulaima I am spellbound and I’ll tell you everything you said it’s as if you are a commercial for my book The Vision Map and I don’t mean it in a bad way, I mean what you’ve said that’s come from your heart and the importance in how vital it is, is so exactly right on the money of why that book is so important I’m like you’re endorsing it because you understand and this is why you are successful, because you live, you breathe, you eat, you sleep these principles which yes I want to teach the people in my book The Vision Map, because that’s how you’re going to take any item, any challenge, any environment, any situation just like I did just like you did and turn it around into whatever success you want. It’s not magic it didn’t happen overnight, there’s no whatever but it’s with the hard work and focusing on that vision that gets you through an accomplish it. And before I forget your website is numbers spell it S-O-U-L-A-I-M-A.com, right? Soulaima: Thank you Tony, yes that’s my home page. Tony: And if someone wants to get a hold of you, contact you you can be reached that way? Soulaima: Yes absolutely, I read my emails, I pay a lot of attention to my email because that’s the way I get inspired by all those people’s stories and the thing they read and see and I learn from that too, so yes feel free to contact me I would take that as a big honor yes. Tony: Great, we have a number of entrepreneurs and business owners in the audience please seek out Soulaima and check out her site, she’s got a lot of information and material to help you see your vision, help you see where you’re going, help you see through the fog of the future of uncertainty. This is great stuff I absolutely love it, I don’t want to end the show. All right, thank you once again it was great thank you. Soulaima: Thank you so much Tony, thank you it was a pleasure thank you. Tony: And for my amazing audience thanks so much for listening. Remember: Success awaits those who persevere and remain steadfast despite the odds. Be Righteous. Join me on the next episode of The Tony DUrso show. Outro: We hope you’ve enjoyed this week’s edition of the Tony DUrso show with his key influencers, be sure to tune in again next Friday at 4 p.m. Eastern Time, 1 p.m. Pacific time on the Voice America Influencers Channel. Thanks again! It’s our honor to have you listen! Click here for the full list of shows by Tony. Remember: Success awaits those who persevere and remain steadfast despite the odds. Be Righteous. Join me on the next episode of The Tony DUrso show. Christy Whitman: Celebrity Coach & Abundance Expert! Brad Dude & Eric McGehearty: Leader & Globe Runner!